Can you provide the code through open source? Wow, This is really cool. If the projector didn’t cost so much, I would probably make this. It was very clever to put it into a lamp. i can’t find what laser projector is used. up to 150″ screen size ! The full instructions and materials (including the projector) is on the hackster.io link. How is this augmented reality , can you physically interact with what your projecting. If so how . Either way I like it don’t want to sound negative. Just curious. My understanding of AR is that it doesn’t necessarily need to involve interactivity (although it can do). I think most examples of AR I’ve come across (well, stumbled across really) do just involve augmenting the real environment with extra information. 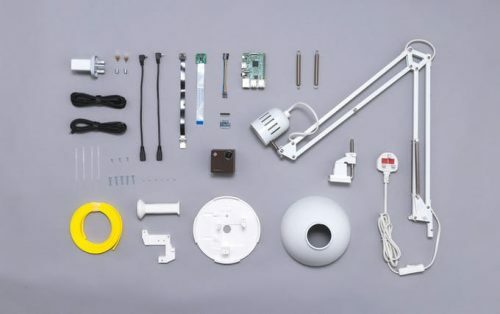 The whole project is not very expensive to built, however the effective part, the UO SMART BEAM LASER costs around $329.00 and its the most expensive part to have to complete the kit! Agreed, then I saw this page. I have not worked out if you could still run the sensors after using up the GPIOs to connect to the projector. Bright! Very bright. I use these in my car because they match the ambient lighting. Work great! I have one to my older mother because she liked them and wanted one to hook up on her nightstand as a pseudo nightlight. Price was great for 5. FYI – no moving or pulsing lights. Just blue LEDs.